by Colin Wright. Published on 3 October 2016. Can you reproduce this drawing? There’s a drawing on the right: see if you can reproduce it without going over any lines you’ve already drawn, and without lifting your pencil from the paper. As it happens, this was exactly the challenge that faced the residents of Königsberg centuries ago: could they take their Sunday afternoon stroll, crossing each of the seven bridges in the city exactly once? Some have it that the puzzle required that they return to their starting point, while others didn’t add that extra condition, but over time all the residents came to agree that it was impossible. And that’s where normal people leave this sort of puzzle. They try for ages, decide they can’t do it, and put it down. On the other hand, mathematicians then take up the challenge: is it really impossible? Can we prove it to be impossible? 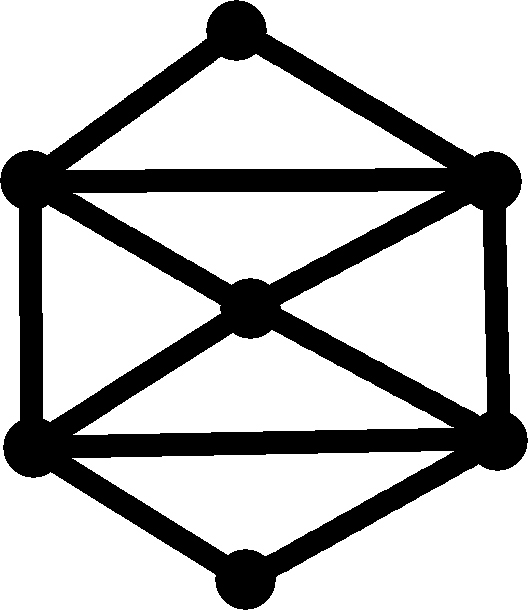 That was done, as many readers will know, by Euler in 1736, and is marked by some as the birthplace of graph theory. Euler reasoned that if it were possible to walk about and cross every bridge exactly once, then every piece of land you visit has to have an even number of bridges—one to enter and one to exit for every visit. The plan of Königsberg, however, clearly shows that every piece of land has an odd number of bridges. So it is clearly impossible. And so it is when trying to reproduce a drawing. 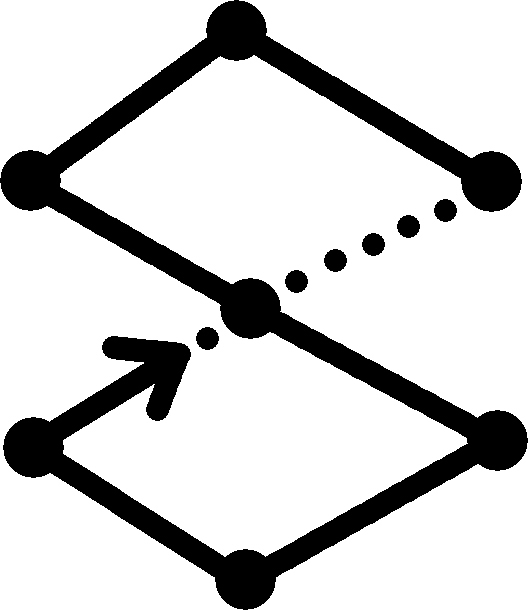 To be able to draw the first diagram (or any other diagram) without retracing lines, and in a single continuous stroke, every vertex, every meeting place, must have an even number of lines entering it. If not, we will enter and depart some number of times, and finally enter and have no way out. Of course, it’s OK for the starting point and ending point to have an odd number of lines, but those are the only two. 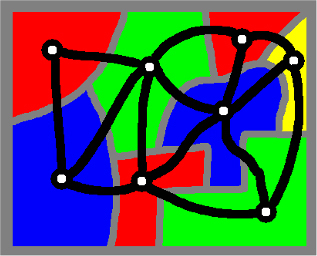 Returning to our original puzzle, we can see that we must start at one of the bottom two points and end at the other, but since every other vertex (meeting place) has an even number of lines, it must be doable. Have you seen the trap? I’ll give you a moment. It’s subtle until you see it, and some people still don’t really understand, even when it’s pointed out. Have you seen it? Take a moment. So what is the trap? I have followed in Euler’s steps and shown that if a diagram can be drawn then all but at most two of the vertices must have an even number of lines. I then asserted—without proof—that the converse was also true. I said that if every vertex has an even number of lines meeting it, then it will be drawable. 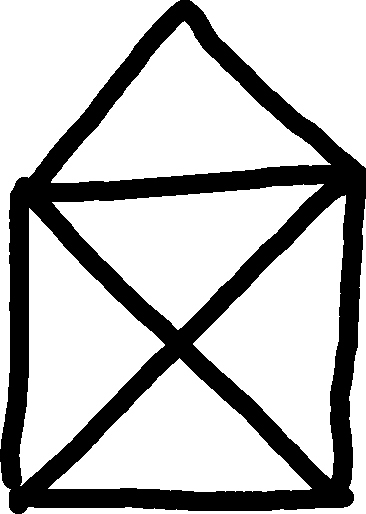 Every vertex has an even degree, yet the picture cannot be drawn with a single stroke. Ah, but it’s not true. Even though most people get left with the impression that this is true (and most of the time when this is shown to children the implication is obvious) it actually isn’t. At this point some of you will be spluttering, but others will be nodding along. 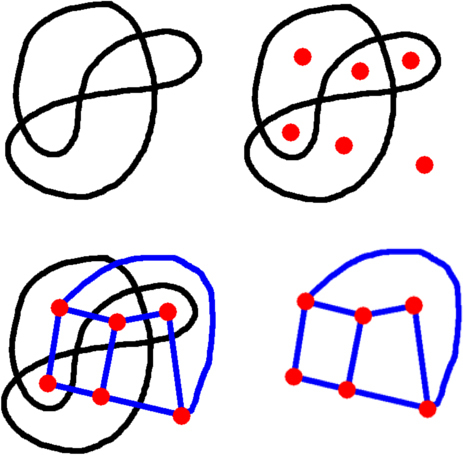 On the right is an example of a diagram where all the vertices have even degree (an even number of lines) and yet it cannot be drawn in a single stroke. Now some people complain that I’ve tricked them, and of course they were only thinking of connected examples. Well, fair enough, if you were only thinking of connected examples then maybe it is true. But is it? Really? How do you know? Every connected network in which every vertex has even degree can be completely traversed in a single journey that returns to its starting point and does not retrace any paths. Now you’ll notice here that I’ve added the condition of returning to where we started, because that now means that we can’t have the alternate condition of two vertices having odd degree. It just makes life simpler, and it’s not hard to prove the more general case from this one. So how do we prove this? There are several proofs, and people differ as to which they think is the easiest and cleanest. The one I like is the following. Take a walk, and return to where you started. You never get stuck when you do this, because at each vertex you use lines in pairs, so every time you come in, there’s always a way out. If you covered every path, you’re done. If not, do it again, but when you come across one of the paths you didn’t take last time, take it now as a diversion, and wander about on paths you didn’t cover the first time until you return to that branch point, and then complete your original journey. You’ve now covered more of the network. Keep doing this, keep augmenting your journey, until finally you’ve covered everything. Here’s another example of a doodle that can be drawn in a single stroke. That’s not a formal proof, but it gives the right idea. You need to check that the things I’ve told you to do are always possible, but that’s not too hard. So in this case the converse is true: you can draw the diagram if and only if every vertex has even degree. It’s interesting to note that neither the statement nor the proof actually require that the network be drawn on a plane as a diagram. It’s true for networks in general, which is nice. But now, let’s consider the case where it is drawn on a plane. Here’s an example on the left. Every vertex has even degree, so we can draw the network, returning to our starting point, without retracing steps, and without retracing a line we’ve already drawn. A failed attempt to draw the doodle without crossing a line. So far so good. Claim: we can draw this in a single pencil line without crossing over a line we’ve already drawn. Try it. To the right there’s an example where it’s gone wrong. In this attempt we’ve made a good start, but got ourselves into a position where as we approach the next vertex we can see that we will have to cross over a line we’ve already drawn. So that’s not allowed. Can we draw the lines through a vertex like this? Again, if any vertex has an odd degree then we won’t be able to do this, but now the claim is that the converse holds, and it’s no longer quite so obvious. A few examples and you might convince yourself that it works, but just because it works on a few examples, that doesn’t mean it’s always true. So is it always true? Can we make every vertex look something like the picture to the left? Well, yes, we can make every vertex look something like that, and the proof is quite similar to the one we gave above for the original problem. We won’t go into it here, we’ll leave that as an exploration for the interested reader. examples. Get someone else to draw a doodle, and try to colour that. Try to draw one that can’t be coloured. You’ll find that you can’t, no matter how hard you try. Claim: every doodle can be two-coloured. Again, at this point normal people will say “huh, that’s curious” and then move on. Mathematicians, on the other hand, will wonder why this is true. Indeed, they will start by wondering whether it is true. Sure, it worked for all the small examples they tried, but what if there’s a doodle with a million billion regions, will it still work for that? A doodle with its vertices slightly “exploded”: the doodle is simply a distorted circle. we never cross over a line we’ve already drawn. That means the vertices can be sort of `exploded’ into small regions of their own, and the path enters and exits the region without ever touching the other parts of the path that visit that vertex. Now the doodle is simply a distorted circle, and that means it has an inside, and an outside. We can shade the inside, and now we have a two-colouring of the original doodle. Of course, colouring regions like this restricts us to living in the plane, but there’s a way to release ourselves from this limitation. What we do is think of the regions on the doodle as countries, and put a capital city in each country. Then if two countries share a border, we join their respective capitals with a road. In this way we end up with a new network, a network of roads. Colouring the regions corresponds to colouring the capitals, and the rule is now that if two capitals are joined by a road then they must get different colours. Below we can see a general example, not just one that’s made from a doodle. Here’s a coloured map with its capitals connected. So now instead of a map we have a network, and instead of colouring regions, we are colouring vertices. The reason this is useful is that networks are an abstract concept, not limited to living in the plane. With a map in the plane, for example, it’s impossible to have five regions that all border each other, but with a network we can simply declare that we have five vertices and edges between them all. We have gained flexibility and generality, but we have now lost our proof that certain networks/doodles are two-colourable. But we can rescue that. In our new network, imagine moving from vertex to vertex, travelling around the network and returning to where we started. 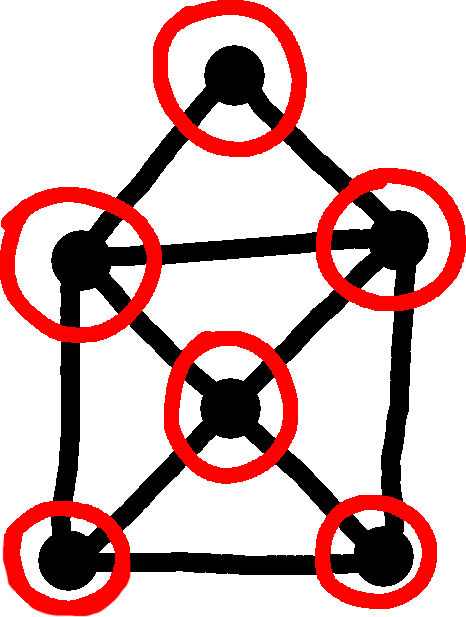 If the network vertices can be two-coloured (and remember, they correspond to the regions in the original doodle) then we must alternate colours: black, white, black, white, and so on. So any wandering around the new network must consist of an even number of steps. So now we have a simple way of deciding whether or not a network can have its vertices two-coloured: check to see if every circuit is of even length. That sounds like a huge job, but actually there is a really easy way of doing it. Colour one vertex red, then all its neighbours green, then all their neighbours red, and so on. If you succeed then you’ve proved that all the circuits are of even length, because when you traverse a circuit you keep alternating colour. But if that process goes wrong it’s easy enough to show that there must be an odd length circuit. We’ll leave that as an exercise for the dedicated individual. So where is this pot of gold? So we have shown that there is an easy way to see if a network can be drawn without lifting the pencil off the paper. The same test, to check whether every vertex is of even degree, even works for networks not necessarily limited to the plane. We’ve also seen that there is an easy way to discover whether a network can have its vertices two-coloured: it’s possible if and only if every circuit is of even length, and we can test that just by trying it! If it fails, we find an odd length circuit. If it succeeds, then, well, it’s succeeded. So there is a simple test to see if we can visit every edge of a network, and there is a simple test to see if we can two-colour the vertices of a network. What next? Well, we can ask if there is a simple test to see whether we can create a cycle that visits every vertex of a network exactly once. 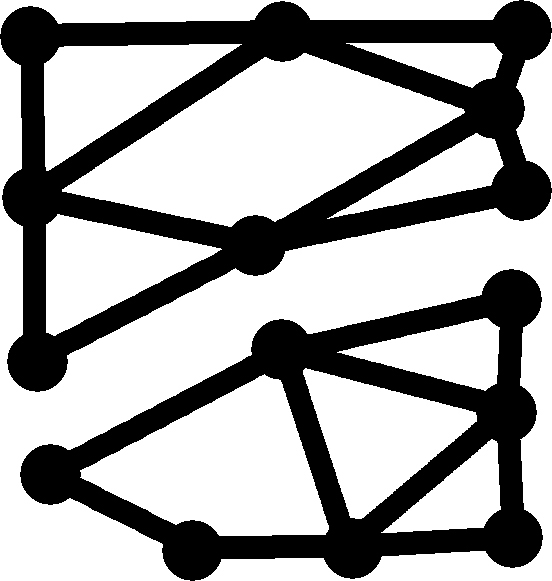 Or we can ask if there is a simple test to see whether it’s possible to three-colour the vertices of a network. And here is the fun part: no one knows. The first question—finding a cycle that visits every vertex—is called finding a Hamilton cycle, and we know of no easy way either to find one, or to prove that there isn’t one. The second question is simply called three-colouring, and there is currently no known efficient way of knowing whether an arbitrary network can be three-coloured or not. We just don’t know. People have investigated these questions for a long time and they have discovered something really cool. If you can solve one of these problems, you can use it to solve the other. So in some sense these two problems, even though they look totally different, are kind of the same. And there’s more. These two problems are not an isolated pair. There are hundreds of problems that are all basically equivalent. And because they are equivalent, solving any one of them will thereby solve them all, and similarly, showing that any one of them has no solution will as effectively show that none of them have solutions. This question—whether these problems have efficient solutions or not—is known as the P vs NP problem, one of the Millennium Prize Problems published by the Clay Mathematics Institute, and for which they have offered a one million dollar prize.